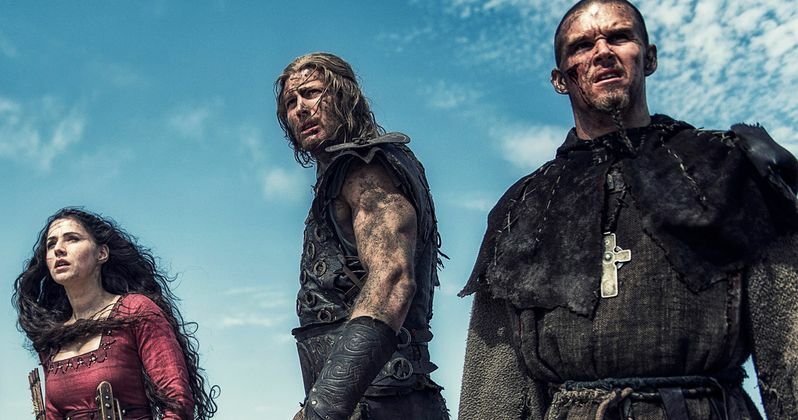 Anchor Bay Entertainment has provided us with 15 exclusive photos from Northmen: A Viking Saga, debuting in theaters and on Digital HD July 31, before arriving on Blu-ray, DVD and VOD August 11. These images feature Ryan Kwanten as you've never seen him before, along with Tom Hopper, Ken Duken, Charlie Murphy, Ed Skrein, Anatole Taubman and Johan Hegg . Claudio Fäh, best known for sequels Hollow Man II and Sniper: Reloaded, directs this epic adventure. Northmen: A Viking Saga tells the story of a group of Vikings in the ninth century who sets sail for Britain, aiming to plunder the rich monasteries in the northern part of the island. But a storm smashes the ship to pieces on the rocks off the coast of Scotland, the only part of Britain without any Viking settlements. Soon thereafter, the daughter of the Scottish King falls into their hands and the Vikings see this as an opportunity to demand a large ransom. The King immediately sets his 'wolfpack' - a group of mercenaries well known for their savagery - on the Vikings. The "Northmen" with their hostage now have to force their way through the rough highlands, where they meet the brave and mysterious Christian monk Conall (Ryan Kwanten). Having the wolfpack close on their heels, a desperate race against time begins. A battle over life and death. Take a look at our exclusive photos below, before Northmen: A Viking Saga hits theaters and VOD formats at the end of this month.